More than 50 million small businesses have an active presence on Facebook, using the free Pages product to help raise awareness and attract more customers. Of those 50 million businesses, over three million are active advertisers on Facebook, up 50% in one year. This is good news! Clearly, with an increase in active advertisers, businesses are seeing meaningful results by placing paid promotions on Facebook. Facebook ads is by far the most targeted traffic your advertising dollars can buy. My business storyWe’re in the business of helping you achieve your business goals using Facebook! This new video tool uses technology similar to the Friends Day and Year In Review videos that you’ve likely seen on personal profiles. With the “Your Business Story” video tool, Page admins choose 8 photos (from any of your Page photo albums, including your most popular), then fill in the blank “We’re in the business of ________________,” choose your music track, and voila! We know it’s not easy for many businesses to create ads and content, so we created a simple tool that helps them tell their business story to their customers. As part of the tool, businesses are able to upload their photos from their page, overlay with music (licensed by Facebook) and share “what they are in the business of” doing. “We (at Facebook) are in the business of helping your business grow” and we hope that all of the businesses on Facebook will create their stories and post them to their Pages. Your Business Story is a free tool from Facebook that allows you to create a short video celebrating what your business brings to the world. Only you can see the Your Business Story video, unless you choose to share it. Facebook CEO Mark Zuckerberg has stated in the past that the next billion users will come from regions outside North America. 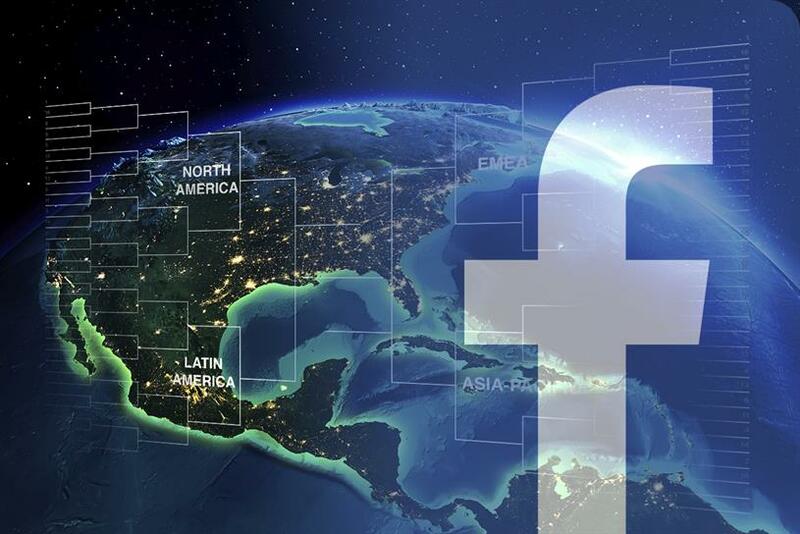 In fact, the company recently restructured the Facebook Awards to better emphasize work from beyond America’s borders. To that end, it’s no surprise that more than 70% of the 3 million active advertisers on Facebook are outside of the US. The fastest growing region is South East Asia. The fastest growing countries are Vietnam, Egypt, Indonesia, Peru, and Turkey (% growth 2015 vs. 2014, as of Dec. 12, 2015). And, the top five countries based on Y/Y growth: U.S., Brazil, UK, Italy, and Australia (# growth 2015 vs. 2014, as of Dec. 12, 2015). Do you use the Pages Manager App? If not, you should! Over 20 million Facebook Page owners use the Pages Manager App to create and schedule posts, check stats, and reply to private messages. 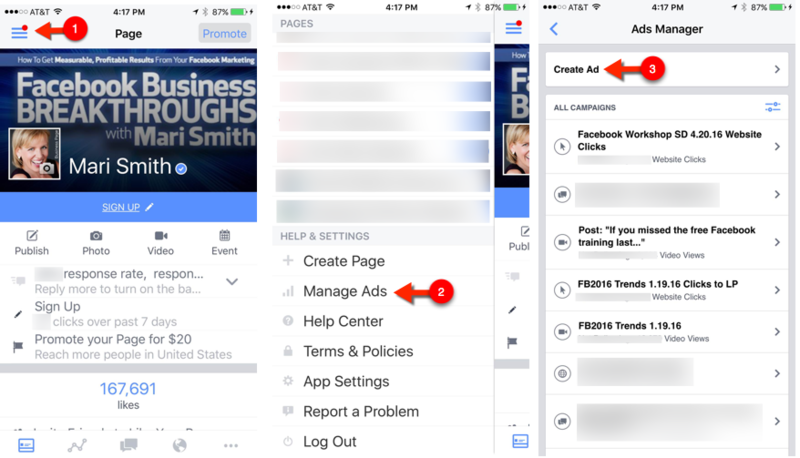 Plus, to create and manage ads, you can use any of these three apps: 1) the dedicated Facebook Ads app (recommended), 2) the regular Facebook mobile app, or 3) Pages Manager App. More than 1 million advertisers create an ad directly from a mobile device. To access your ads on the Pages Manager App, tap the three horizontal bars at the top left, then scroll down the left menu to the bottom and tap Manage Ads, then review campaigns and ads or tap Create Ad. 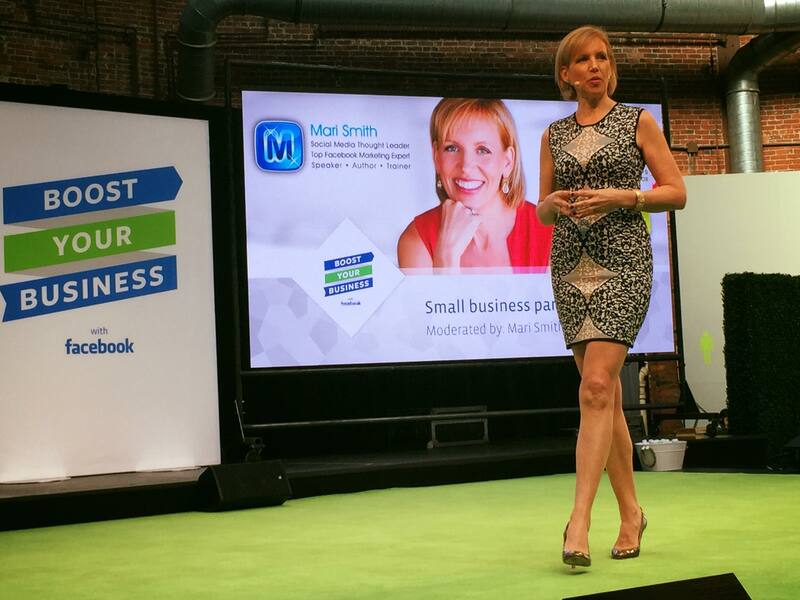 Whilst on tour last year with Facebook to present at the Boost Your Business series of events, I was heartened to see how eager and receptive small business owners are to get a better understanding of the array of ad products. I also sat down with over 200 individual small business owners to provide 1:1 consultations and answer their #1 question about growing their business on Facebook. The most popular challenges small business owners face is what to post: why types of content, how often, what day, what time of day, what mix of personal vs business, how to generate more business as a result. Which posts should I boost? Should I use the Boost button or Ads Manager? Does it make a difference? Why is organic reach so low? How much should I allocate for a realistic advertising budget? What size target audience is optimal? Is it safe to upload your email database to Facebook? I own a spa (hair salon, bakery, antique store), I just want to get more people coming in – how do I do that? I tried Facebook ads and spent a fortune – it didn’t work for me. What did I do wrong? If you’re ready to ramp up your Facebook marketing results, I’d love to help you! We’re currently running a special on my signature training program FACEBOOK BUSINESS BREAKTHROUGHS that includes one full year membership in my Inner Circle program! In this six-part online training program, I walk you through the exact process that thousands of businesses just like yours are using to generate millions of dollars in sales using Facebook.